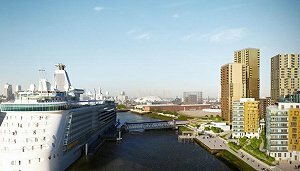 Mayor of London, Boris Johnson has given the final go-ahead for Enderby Wharf, a controversial cruise liner terminal in Greenwich – the first of its kind in London, despite huge uproar from the local community due to air pollution concerns. Due to be fully operation in 2017, the terminal is expected to bring up to 55 cruise ships to London annually, as well as create 477 homes, shops, restaurants and a skills academy. It is expected to attract tourists from around the world, particularly from Europe and North America, with London to become the starting and finishing point for worldwide cruises. The scheme is being backed by investment bank, Morgan Stanley, and housing developer Barratt who will deliver the new homes in three high-rise housing blocks.